Whenever December rolls in to close the curtains for the year, it brings along an air of generosity as the month is full of joyful occasions that are traditionally celebrated through the act of gifting. Grab sees this and has started a campaign that leverages off this merry season and allows the public to get involved in a good deed that is perfect to finish off the year with. From 12 to 24 December, Grab is set to launch a regional donation campaign called Delivering Happyness that will run across six Southeast Asian countries such as Singapore, Indonesia, and of course, Malaysia. As the name suggests, the campaign opens up an opportunity for members of the public to send presents to children in need of an extra cheer this holiday season. Interested parties can start joining this campaign by packing any pre-loved books, stationery and toys that they feel would be appreciated in another home more. Brand new items are also welcomed! Once the items have been neatly packed, donors can use the Grab app to request for a Grab driver. All that needs to be done is to select the ‘Delivering Happyness’ fleet icon and just like with their regular rides booking, donors should indicate their pick-up location and time. The driver will then come over to collect the items. Best part about this is that Grab will sponsor the cost of the collection so not a single penny is needed for this good deed. Through this campaign, Grab hopes to be able to collect a total of 20,000 items across Southeast Asia which will be delivered to 7,000 underprivileged kids in the region. “While people may wish to help the less fortunate, they often don’t know how, or where to start. 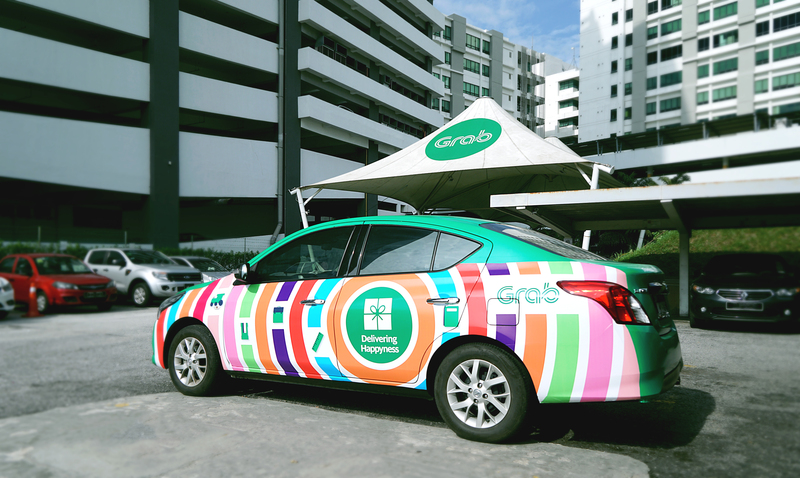 As part of Grab’s commitment to improving lives in Southeast Asia, we’re using the Grab app to make giving as easy as possible—and in the process, deliver happiness to the children in our communities who need it most,” said Cheryl Goh, VP of Marketing of Grab. Where Will Your Items Be Donated? For this campaign, Grab has managed to rope in a few non-profit organisations to partner up with. These organisations focus on helping children in need and each one tackles issues unique to each country, such as helping to re-equip schools in the Philippines that were affected by a recent storm, or giving books, stationery and toys to kids in rural villages in Vietnam. For Malaysia, Grab has chosen NGOHUB Asia as their partner to help deliver ‘happyness’ to unprivileged kids in orphanages all across the country. Delivering Happyness is actually an extension of a similar campaign they had back in 2013 where they delivered 2,000 pre-loved books and toys to rural libraries in Malaysia. The effort of matching donors to drivers was replicated with this campaign as Grab believes people can feel rewarded knowing that a child’s life could be enriched from this simple deed. So those clothes in your wardrobe that you think you can fit in one day after miraculously losing 5kg? Or those old books that you thought you would have time to reread but never came around to it? Now it’s time to give them a new home, and the whole process has been simplified, thanks to Grab. To find out more information about this campaign, click here for Malaysia and here for Singapore.